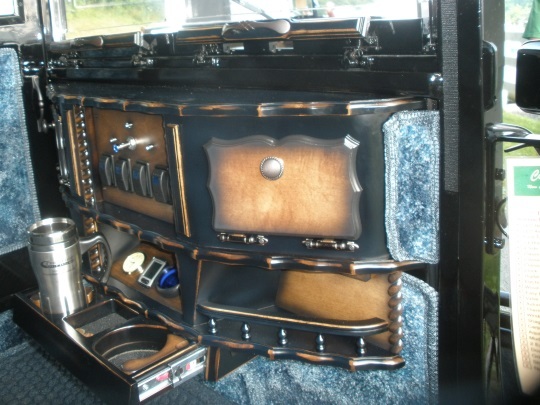 The final price tag on this sweet vehicle is $9,861.18, to be precise. The price gave Jerry “sticker shock”, he says (and this leaves out the horse, which adds around $1600). Just like ordering a car, you get to select your features when buying a new carriage. 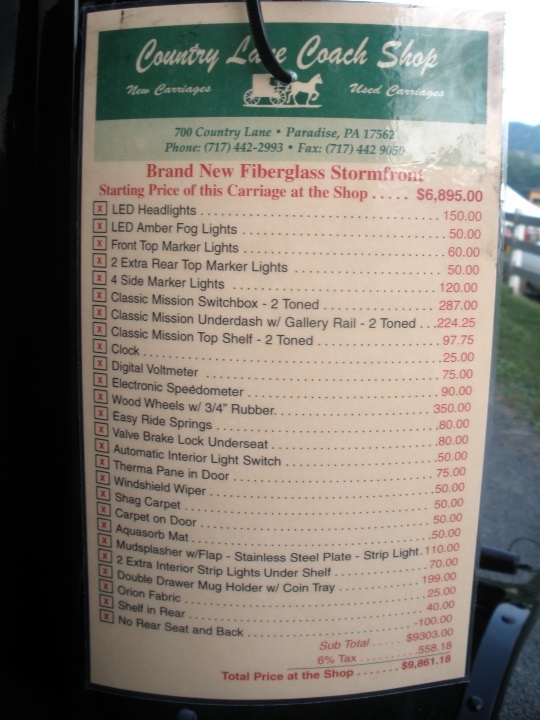 The list below should give you an idea of options available on Amish buggies. Of course, not all churches permit all the features you see here. You can see the price starts at $6,895, and goes up from there. What stands out to you? Notice there is one price deduction on the list. Perry County is a couple counties up and over from Lancaster, on the other side of Harrisburg. 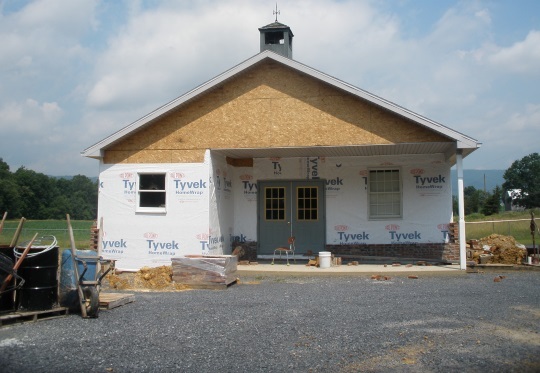 Five Amish congregations make up the community. 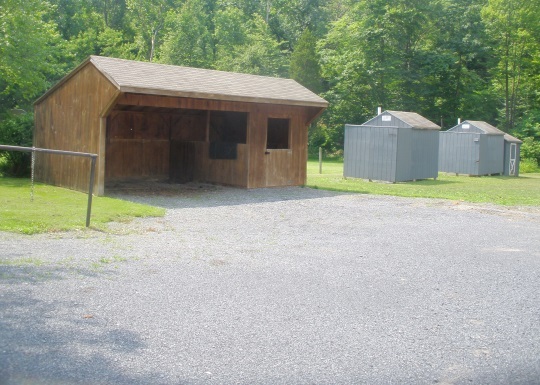 The Perry County settlement spun off from Lancaster County in the mid-1970s. Here’s a horse-powered ice cream project. Jerry says the engine in the foreground is for back-up. 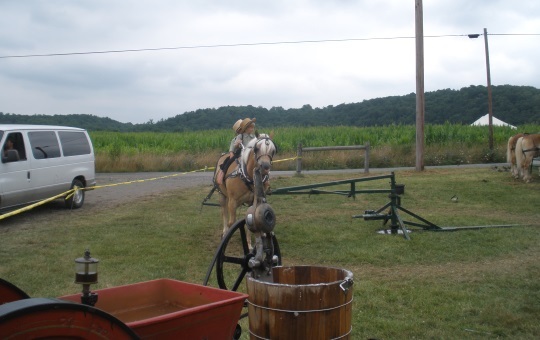 UPDATE: The next three photos show a five-horse team used at last year’s auction to make ice cream. As you can see, lucky children sometimes get a ride while the horse is on the job. 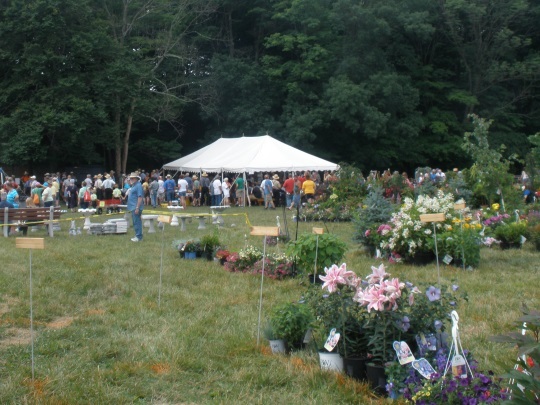 Flowers and more auction activity. Kids up to kid business. 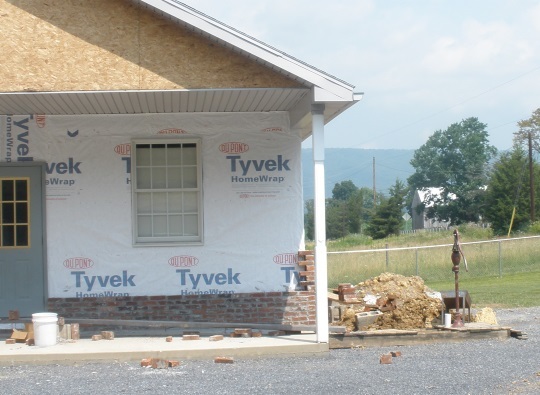 These last shots might be of interest if you’ve been following our building an Amish school posts. You can see how the design is quite different from the Adams County, Indiana school we saw in those previous posts. Just curious–how do the “animal rights” people feel about making the horse work to freeze the ice cream? I don’t know how animal rights people would feel, but I don’t think there’s any question horses, like other animals, need exercise to stay healthy. 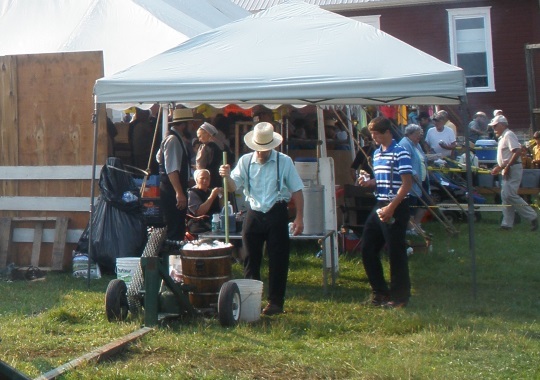 This is the only Amish auction that I attend that uses horse power to turn the ice cream machine. Most events use a few “hit or miss” engines to run the ice cream makers. “Hit and miss” engines are a marvel in their own rite and they amaze me. In years past the owner uses these four perfectly matched medium sized work horses to run turn the freezer. This year only three horses are present and I asked about the fourth horse. She is a mare and just had a foal and he decided to keep her at home. Each horse does 30 minutes and is switched out. 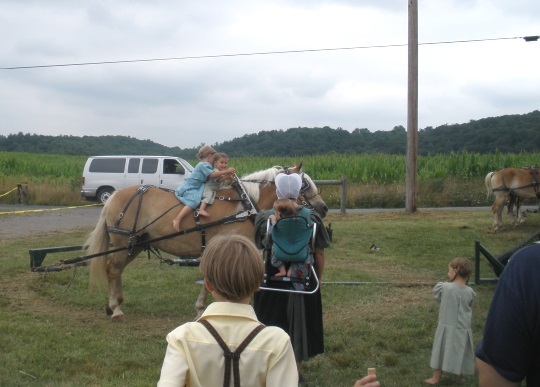 Sometimes he gives Amish children rides on the working horse. I think I have a photo of that and I will try to locate it and send to Eric. It will be from last year I think. These horses are often used as a four horse team to do field work. Mostly in the hay fields and some spring plowing. I checked the feet and each horse was well shod and each was in very good condition. These three horses are well versed on the ice cream making process as they always step over the chain drive shield. Compared to a working day in the hay fields this was probaly a welcome change to their normal work day. On a related horse topic. 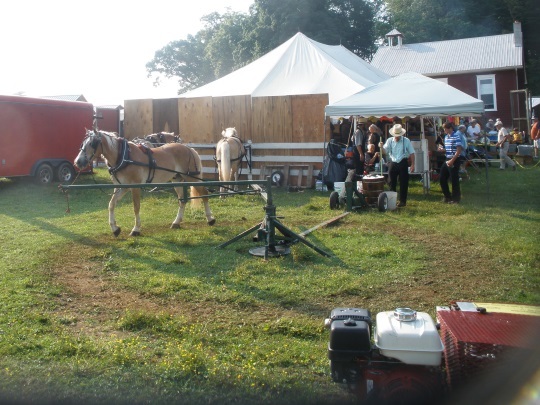 When a single horse buggy arrived at this sale the horse was un-hooked from the buggy, taken to a wash station where the horse and harness is rinsed off to remove sweat and then taken to a huge tent to be hitched. 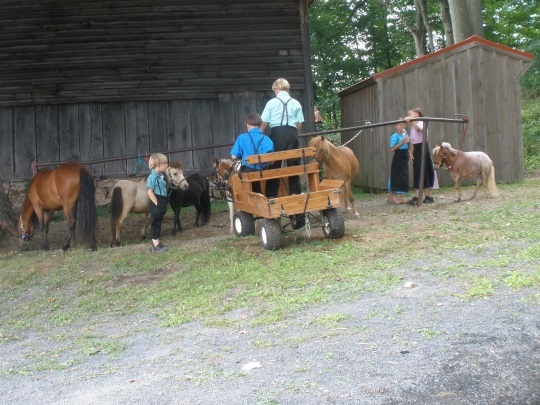 Farm use animals are a hefty investment for any owner and the Amish take great pride in maintaining the horses in good health and kept comfortable. If you’d like to see last year’s ice cream horse team, Jerry has kindly provided a few photos which I’ve updated the post with. He says there were actually five horses on ice cream duty last year, not four. That sounds like a very reasonable price for the buggy. On the other hand, I attend monthly horse auction (Centre Hall) where the driving horses average between $3000 and $5000. 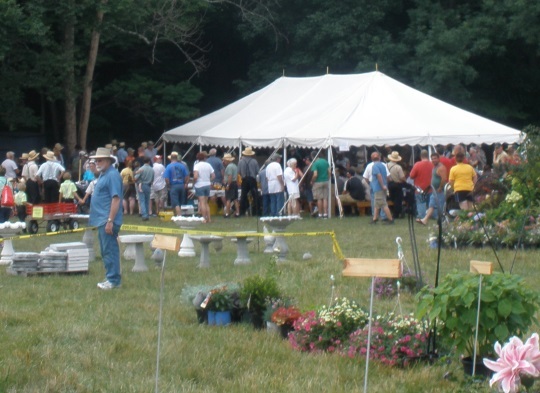 I sold a nice well bred horse at one of these auctions for$3750 three years ago. I csn’t even afford to get back in that market today! From what I’ve heard horse prices have increased quite a bit in the past 5+ years. the simple reply is WHO CARES? Quite frankly most “animal rights” activists are idiots anyway. I am WAY past caring what idiots think … about anything. BTW: When I was a child I read an account (real or fictional I do not know) of a horse that provided power for some sort of industry for years and years, (maybe in New England? ), through the use of a “horse power” (that is the device that the horse in the photo is hitched to). He was given a break every day at noon when the employees took their lunch. When they returned to work, so did he. Finally they felt that he was far too old to do such hard work and they retired him to live out his days in lush pasture. Soon his appearance deteriorated; he lost weight and his hair coat became rough and unkempt. They all congratulated themselves on recognizing when it was the right time to literally put the old fella out to pasture. They thought he was going to die any day. Then one day the wind changed direction and the old horse caught the sound of the noon whistle in the nearby community. When the employees returned to the plant after lunch they noticed the old guy heading for a nearby tree, where he promptly began to walk circles around it until quitting time. The next day he was at the tree for the start of the work day and continued his “job” of walking around the tree whenever the employees were inside working. When they took a break so did he. When they worked so did he … even he really wasn’t doing any “actual” work. The difference was he gained weight, his hair coat took on a new luster and he was clearly happier than he was in retirement”. In the story he continued on this way for many, many more years. This from a horse that was thought to be dying just any day before he came out of retirement. Like I said, I have no idea if that story was really true or not. I do know that my two big girls, now approaching 10 years old, seem to be much happier and much better behaved when I have some work for them to do. I was just thinking about this today; when I RETIRE I am going to make it a goal to harness them every day and have some little job that we can do together. They have been with me since they were 4 &1/2 months old and I can tell when they are happy & content vs when they are not. Steady work makes them happy horses; of this there is NO DOUBT. So the animal rights crowd can stick it in their ear, or wherever else they might choose. I agree with the people who don’t think a horse walking in a circle is really a big deal. Horses are very strong. We have a horse that gets restless if he’s not working in the field. You hook him up to a carriage and he really goes. He loves getting out. Horses are so well cared for. But I know so many English people (an old friend in particular) who feed their horse moldy hay until they’re sick. Don’t address hoof issues, and have lost a few horses due to neglect (as determined by investigation by a “forensic vet”) But it seems to be bigger news, draw more attention, & excessive outrage when the horse belongs to an Amishman. A horse going in circles making ice cream and giving rides? Oh please LOL That’s nothing. I was a police officer in an area with a large Amish population. I can assure you their animals are treated very well. Those horses are an important part of their lives and are a critical component in providing for their families. Those horses work hard but so do the Amish people who own them. They treat ALL living things with the respect their religion requires. Fully loaded up! The only thing missing is a sunroof. 🙂 Wondering what the lifespan is for an Amish buggy? The puzzling part for me is the “coin tray”. Perhaps for tolls? I don’t think so…..
Mark, any idea why your Holmes County buggies are that much cheaper? I have understood these Lancaster vehicles to be among the most expensive of Amish buggies, but was never sure why. Something different about the construction or features perhaps? I can understand why a Swartzentruber buggy or another group’s plainer buggy with no storm front, electric lights, etc, would be cheaper, but I believe you are in the largest mainstream Holmes County group and so you’d of course have a storm front and other comparable features on your buggies. We do have a storm front and most new O.O. buggies have a hinged back door, but the Lanc. style buggy has a lot of features we do not have, one big $$ being their carriage boxes are mostly fiberglass and our boxes are wood. Things that would make a Lanc. style carriage more expensive: the lift-up back panel with hydraulic arm (like on the back of a mini-van), the sliding doors, the double-storm front (in two pieces with a double latch — ours just snal up to the ceiling or snap shut with a vinyl flap where the lines go), the fancy switch box (our switches are just mounted on the dash but on a “plate” often upholstered the same as the seat), and other features. I’m guessing the biggest is the back panel & sliding doors. Our buggies here are more expensive than lower groups, but a New Order buggy would be more because they have sliding curtains/ doors. I don’t see how PA folks afford it… I could almost buy two brand new buggies for what they give for one. If a family has five sons, that’s almost $50,000 just in giving each one a buggy from home! Add in about $3,000 for each horse (you can’t pick up anything decent for much less) and outfitting five sons with buggy, horses, & harnesses will set you back about $68,000. It will end up costing me more like $43,000. Well that explains it, thank you Mark. Those of us who don’t ride in these every day don’t know all the little details that you probably take for granted. And that is a huge price difference especially when you are talking a handful of boys. By the way, I have heard from a Holmes County minister friend of mine (also in your affiliation) a similar sentiment about the rubber tires (like you mention in your comment below). I greatly appreciate the lifestyle adjustments that horse and buggy require, but this discussion makes me very grateful for our $500 hand-me-down minivan! Don’t all buggies and carriages have wheels? Why would it be an interesting extra option for Wood Wheels with 3/4″ Rubber? Maybe the standard is fiberglass wheels? Or wood wheels with a steel rim? You are right, Linda. Buggy wheels can be wood with steel rim, fiberglass, or aluminum, or wood with rubber lining and steel rim. Fiberglass & aluminum are expensive and if something goes wrong with fiberglass wheels, often the whole wheel needs to be replaced. Some say the fiberglass & aluminum make an unpleasant humming sound. We have different kinds of wheels on our buggies at home and I like the rubber-lined wood wheels best. They don’t look “thin” like aluminum, are not heavy like fiberglass but much quieter with the rubber lining. The best of all? Rubber tires on buggies. 🙂 But in our community only the New Order have those. These pictures are outstanding!! I saw two buggies at the Gordonville auction this past spring that had sunroofs. It was almost comical to see. Again, really enjoyed these photos!! Isn’t this expensive buggy a bit “prideful” for the Amish? It would be sooo AWESOME to ride around in this buggy! If only I knew how to handle a horse! I paid this much for my truck, which is nowhere near as cool! Thank you for sharing! Don’t forget the carpet on door option. How much to add racing stripes and a pair of fuzzy dice for the rearview mirror? I thought it odd for the need of a speedometer? The buggy sure looks like an Old Order Mennonite buggy! I haven’t ever visited any Pa. settlements and don’t know much about them, but am surprised a district’s ordnung would allow such a fancy buggy. This is kind of the way buggies are in Lancaster County and probably many of its related communities, some may even be fancier than this one. Lancaster has a lot of spin-off settlements, some of which are plainer than the home community though, Mechanicsville MD is supposed to be that way. Also southern Lancaster is considered more conservative than the north, don’t know how that translates to buggies though. To me the fanciest or flashiest buggies I’ve seen are the ones in northern Indiana (Elkhart-Lagrange), with the mud guards over the wheels and the ultra-bright lighting in various arrays. From a plain Amish perspective that buggy is a shame and disgrace, worldly and obviously owned by somebody on the fringe. In most Amish communities such a buggy would get you excommunicated. Even Lebanon Levi and his boys would likely put the fire to that one. I can hear them now, “Burn baby burn”. Even the bishops would thank Lebanon Levi for helping to clean up the district. I live in central PA and do a lot of taxi work for the Amish. This carriage looks normal to me for a gray one. 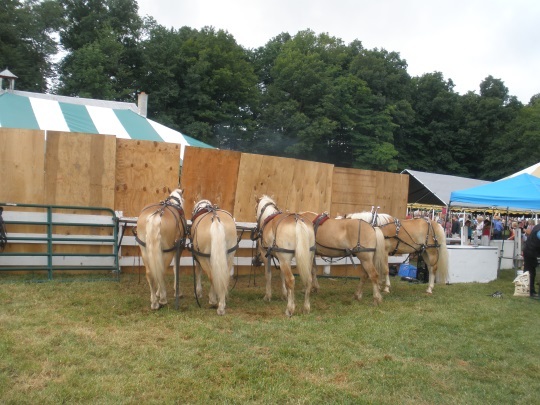 I have also seen the white, yellow, and black ones and I have personally ridden in a gray one very similar that belonged to a very nice Old Order Amish couple who are not on the fringe or borderline. Having taken passengers to coach shops on business, I can tell you that there are many vehicles being made like this. 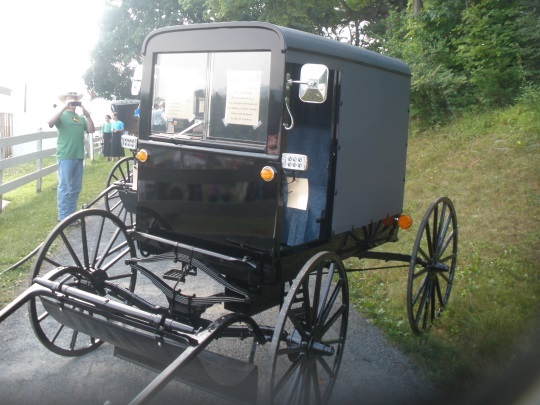 It might not match the carriages used in all areas — in fact we see Amish groups not far away who would not be allowed to have one like this, but to imply Lancaster Co. bishops would thank Lebanon Levi for burning this one is offensive. This is a very typical Amish buggy. I’ve been in many of them. It’s just borderline fancy compared to 95% that I’ve rode in. 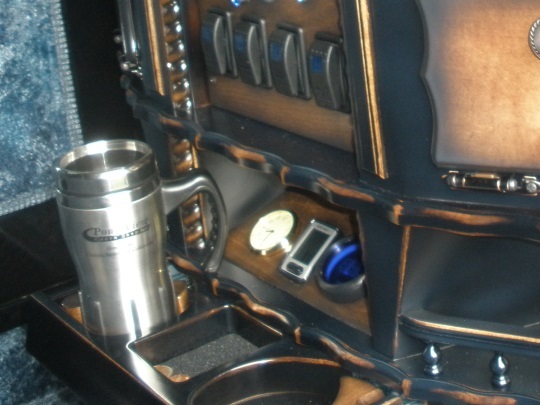 But most have cup holders, cherry wood finish, speedometers & clocks. Nice, soft seating front & back as well. Several of our employees are Old Order Amish and they say this is a typical carriage for the Lancaster-type Amish but some owned by youth will be fancier and some owned by older folks will be plainer. “Obviously owned by someone on the fringe”? Not true. I’m not sure if you’re being tongue-in-cheek here, but I will agree with what Kate and Anonymous wrote that there’s nothing odd about this one and it’s not a fringe carriage. It looks like a normal Lancaster type PA buggy to me, nothing shameful or disgraceful about it. I’ve ridden in buggies very much like this one several times. I would be very much surprised at a bishop approving of burning it; now THAT would be a shame and disgrace!